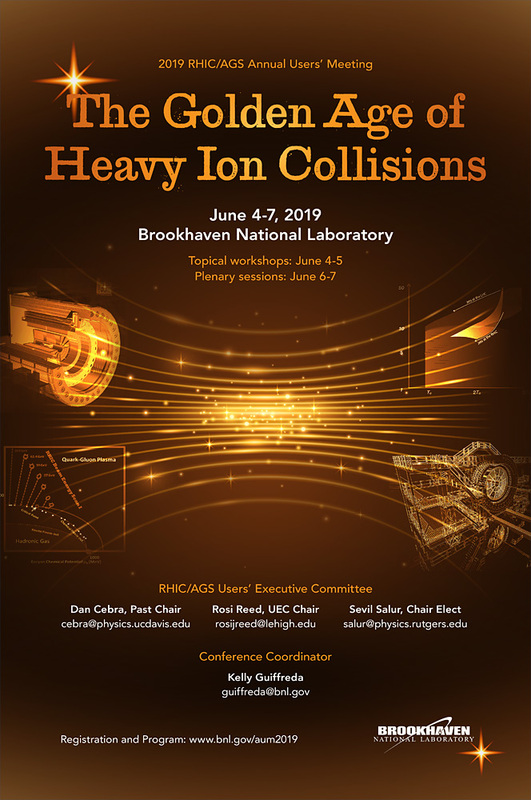 The Annual RHIC & AGS Users' Meeting will be held on June 4–7, 2019 at Brookhaven National Laboratory. The theme of this year’s meeting is "The Golden Age of Heavy Ion Collisions." This year's meeting will cover all aspects of the RHIC/AGS scientific program, from the newest results of the beam energy scan to the latest measurements with polarized proton-proton collisions. Workshops that will be held on Tuesday and Wednesday June 4th and 5th will enable more in-depth discussions of isobar & beam energy scan programs, measurements of hard probes in heavy ion collisions, studies of small systems and cold QCD with a look at future upgrades. A special workshop on diversity and career development and inclusiveness will be held Wednesday afternoon. The presentations of the latest physics results from STAR and PHENIX experiments, an in-depth look at the proposed detector upgrades, reports from representatives from the funding agencies, and award ceremonies will be held during the plenary sessions on Thursday and Friday June 6th and 7th. The meeting will adjourn with an open forum followed by a catered luncheon on Friday afternoon. Registered attendees are invited to attend the optional dinner, reception, and an end-of-meeting luncheon. Please note, there will be a fee in order to attend the dinner. However, the cost of the dinner will be discounted to $25 US for the first 30 registered student/postdocs. There will be a reception on Thursday, June 6, 2019, 6:00 PM in the lobby of Berkner Hall (Bldg. 488), compliments of BSA. Note: This meeting falls under Exemption E. Meetings such as Advisory Committee and Federal Advisory Committee meetings. Solicitation/Funding Opportunity Announcement Review Board meetings, peer review/objective review panel meetings, evaluation panel/board meetings, and program kick-off and review meetings (including those for grants and contracts) and is open to the public. Brookhaven National Laboratory conducts research in the physical, biomedical, and environmental sciences, as well as in energy technologies and national security. Brookhaven Lab also builds and operates major scientific facilities available to university, industry and government researchers. Brookhaven is operated and managed for the U.S Department of Energy's Office of Science by Brookhaven Science Associates.